Gianni Garko and William Berger star in this light hearted and well written Spaghetti Western. German R2 DVD from the Halleluja Boxset. By 1971 the Spaghetti Western had passed its peak, but it remained popular with audiences, and genre titles would be shot for another six years - by this time however, a lot of the titles had resorted to gimmicks to retain their appeal, from Kung-Fu (My Name is Shanghai Joe (1972)) to slapstick (the Trinity films) and pure surreality (Blindman (1971)). Fortunately They Call him Cemetery, although from the writer of My Name is Trinity (1971) , avoids most of this and is a relatively straight forward, although quite humourous Western. The script is generally strong, with an interesting mix of a traditional Western storyline - the boys defending their father and his ranch from the gang who claim protection money - and a typical Spaghetti Western theme - the duelling Bounty Killers. All of the usual sequences are in there, from the boys learning how to be expert gunslingers, to the big barroom brawl and plenty of big gunfights - unfortunately, a lot of the film lacks a narrative drive and becomes quite episodic, but it picks up towards the suitably climactic conclusion (although the ending is a little drawn out). The humour is surprisingly clever for a Spaghetti Western, and more than just the usual slapstick. Director Giuliano Carnimeo (as usual credited as Anthony Ascott) best known for the Sartana films, gives another strong directoral turn here, working as usual with cinematographer Stelvio Massi who often takes advantage of the long and short focus abilities of the scope lens. The soundtrack, from composer Bruno Nicolai, has a good main theme and supports the film well throughout. Gianni Garko takes the lead role here, by now a genre veteran he looks the part completely, with some good gunslinging skills on show. He is joined by William Berger who seems to be playing a very similar part to his 'Banjo' character in Sabata (1969). The two McIntire brothers are played by the otherwise unknown John Fordyce, and English born Chris Chittel (who is now best known as Eric Pollard on the British TV soap Emmerdale) who both give good and convincing performances. The rest of the cast is filled with a variety of familiar faces. Avoiding the descent into parody and slapstick, They Call him Cemetery is an entertaining if rather unremarkable Spaghetti Western, boasting strong direction and another good turn from Gianni Garko. Genre fans should enjoy this, but newcomers will find a lot better titles out there to watch first. Partly recommended. Any gore/violence? Lots of Western violence, nothing bloody. Spaghetti Western fans should enjoy this solid genre entry, but nothing special for newcomers. The picture quality is decent with noticable grain and some print damage (a few scenes also look quite soft), but generally strong and more than watchable. Audio Original German and Italian mono tracks, both sound strong but there are occasional moments of lower quality. Subtitles German (for the Italian track). English (translates the Italian) - good, with only a couple of minor spelling errors. 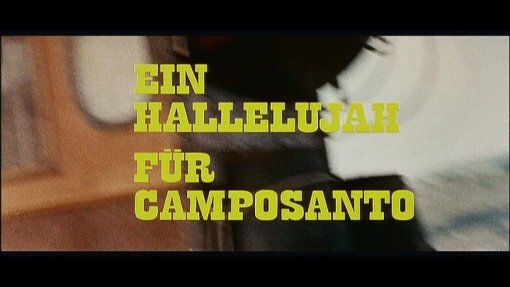 Ein Halleluja für Anthony Ascott - an interview documentary with Anthony Ascott, George Hilton and Gianni Garko, talking about their work in the genre, including this film as well as the Sartana films. Very interesting. 25 minutes. Mostly in Italian, with English and German optional subtitles. Lengthy original Italian theatrical trailer. Spoiler filled. A manually scrolling poster, lobby card and stills gallery. This disc is only available as part of the Halleluja Italo-Western Box. Other regions? Also available on a Spainish disc. This is the only disc with English options. Cuts? Believed to be fully uncut. Print used is German language. An enjoyable and easy to watch genre entry, with some good acting and directing, a little unremarkable. Partly recommended. A good looking and sounding release, with an interesting interview segment. Lack of English dub may annoy some, but the subtitles are good and easy to read. Unlikely to be bettered. See our reviews of more Spaghetti Western and Gianni Garko DVDs. Find the other films in the Halleluja Italo-Western Boxset. All text in this review written by Timothy Young - 6th July 2007.